Here's is another great recipe for BBQ's or grill in the oven. 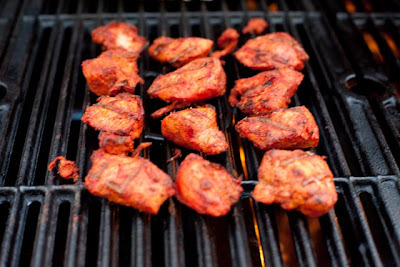 Tandoori Chicken is usually very tender and juicy since it's usually marinated for many hrs and has yogurt in it. It's healthy and easy to make and also a dish that everyone loves. Here is the recipe. 1) Mix all the ingredients in a bowl really well. Taste to make sure there is enough salt and spice. You may add more spice or less spice depending on your palate. 2) Add Chicken into the marinade and let it sit for 10 to 12 hrs. You may either BBQ it or grill it in the oven. Baste is with butter while cooking it. Serve hot with some mint chutney.